The world is filled with unique cars. Some are made interesting from pop culture, such as the DMC DeLorean from “Back to the Future” or the 1970 Dodge Charger from the “Fast and Furious” franchise or even a 1967 Chevy Impala from the CW show “Supernatural.” Other unique cars are created by inspired people. One such car, now placed in the Klairmont Kollections in Chicago, can be tied back to North Dakota and specifically to a Minot man. Henry Vannett was the son of Cicero and Alma Vannett. He was raised in Minot and started his career in auto body at Nybakken Body Shop. 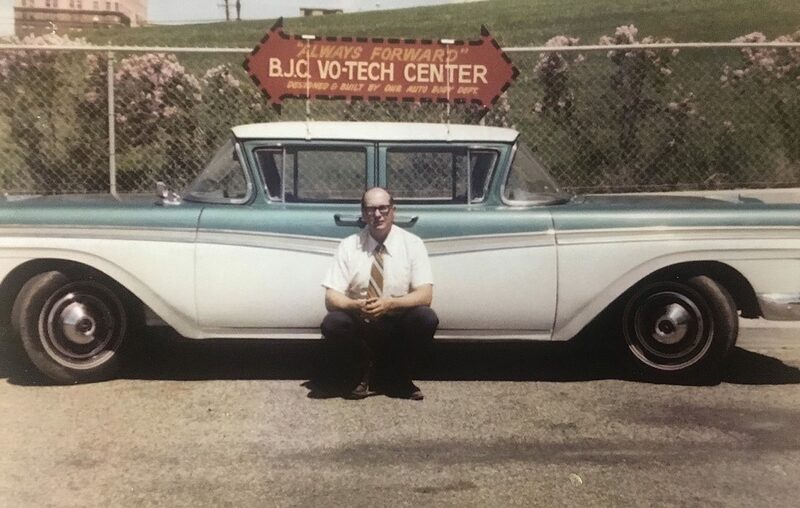 In the 1966, Henry Vannett began his teaching career at Bismarck State College, teaching autobody classes. He saw two 1957 Fords sitting around and an idea popped into his head. In a piece provided by his sister, Lillian Vannett, Vannett said he thought “maybe I should put them two together.” It was something he had never done before and wasn’t entirely sure how to accomplish. He asked 20 of his students from his classes to help and for the next two years the group embarked on doing something special with the car. Then in the late ’60s, they had completed their Frankensteined car. The two old Fords had become one, attached almost seamlessly together to form a vehicle with two front ends and the capability to drive from both. Vannett’s car became a highlight around the state as he drove it to not only showcase the work he and his students had done but to also participate in parades as a unique sight. After some time though, the car was sold and Vannett lost track of it. Then he received a call. His specially made two-way car had made its way to Chicago and was now a part of the car museum Klairmont Kollections. Klairmont Kollections consists of over 300 stunning, impressive, and clever vehicles under one roof. From classics to unique works like Vannett’s car, they offer an experience a car enthusiast will enjoy. Vannett traveled to see the vehicle again, taking his wife and kids to see the car for the first time in many years.